From three-time Edgar Award-winning mystery writer Ruth Rendell comes a captivating and expertly plotted tale of residents and servants on one block of a posh London street—and the deadly ways their lives intertwine. Life in the well-manicured London locale of Hexam Place is not as placid and orderly as it appears. Behind the tranquil gardens and polished entryways, relationships between servants and their employers are set to combust. Henry, the handsome valet to Lord Studley, is sleeping with both the Lord’s wife and his university-age daughter. Montserrate, the Still family’s lazy au pair, is helping to hide Mrs. Still’s illicit affair with a television actor—for a small fee. June, the haughty housekeeper to a princess of dubious origin, is hard at work forming a “society” for servants to address complaints about their employers. Meanwhile, a disturbed gardener, Dex, believes a voice in his cellphone is giving him godlike instructions—that could endanger the lives of all who reside in Hexam Place. 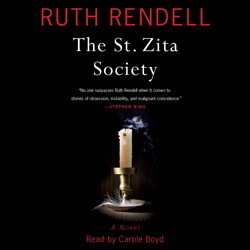 A deeply observed and suspenseful update to the upstairs/downstairs genre, The St. Zita Society is Ruth Rendall at her incisive best. Ruth Rendell is at the height of her powers as a writer in this deceptively simple story of human aspiration and fallibility. Combined with Carole Boyd's superlative narration skills, I found this an eminently satisfying listen. It would take a lot for me to ever give Ruth Rendell fewer than five stars. The late Rendell was perhaps the superlative writer in her genre, bar none, and her legacy will live on. The narration is perfect and the story is Rendell at her spine-tingling best.